What amazingshots (and an incredible experience). Thanks for sharing. I DO feel bad about the mama deer being too nervous to come to the aid of her fawns because of the crowd. 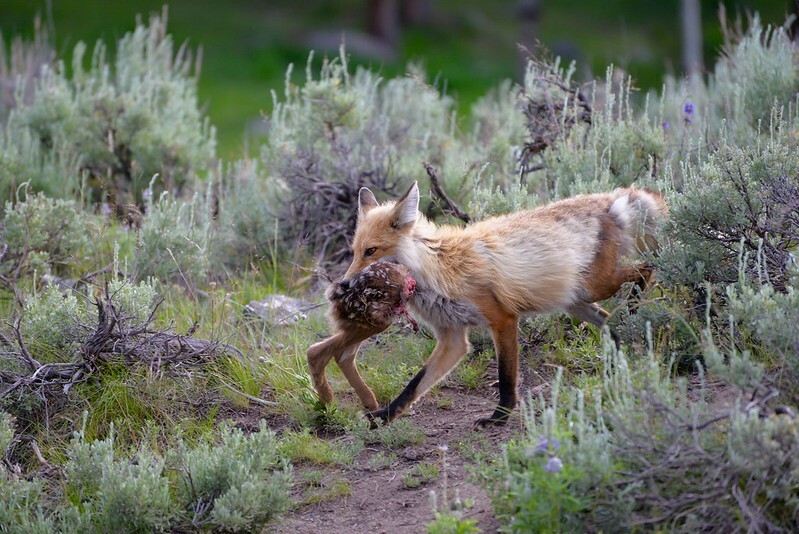 Don't get me wrong, I understand that foxes and other predators needs to eat, and if this fox could manage to take down a fawn, then good for him and his family. 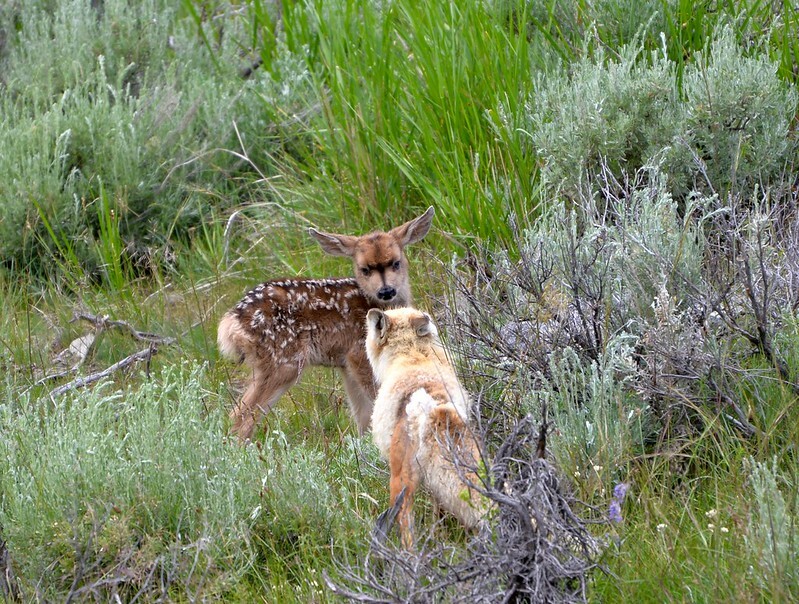 But, if the mother deer could have helped the fawn survive, it's a shame she didn't get the chance because of people. We are supposed to stay at least 25 yards back from foxes and deer, but people just don't. 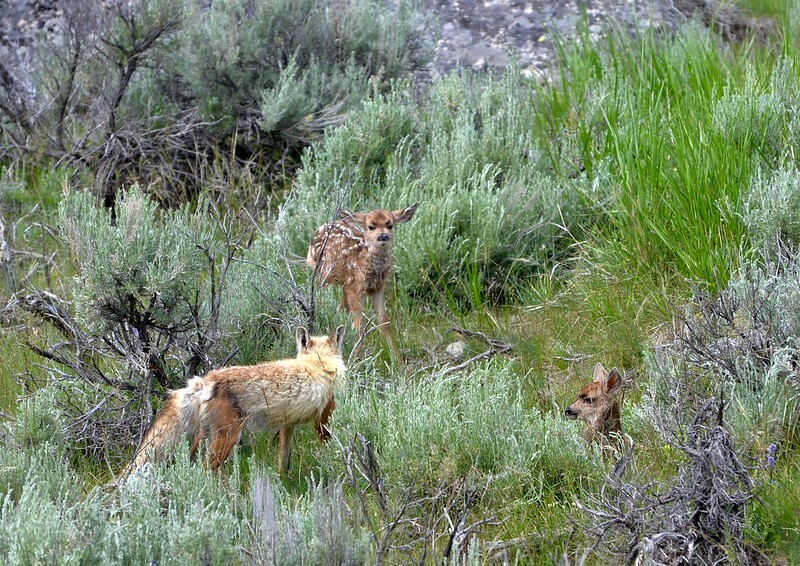 I was in Yellowstone in early June and saw possibly this same fox (at least, it was near the Yellowstone picnic area). It was hunting on one side of the road, and I was REALLY excited to see it, but got more than a little annoyed at the viewing public. LOTS of people crowded around, and pretty soon, some were standing almost right on top of the fox! When anyone would bring up the "let's stand back a ways" idea, a few "experts" would speak up that well, the fox didn't seem bothered by the people, so it wasn't necessary to move back. After it had caught (and cached) a few rodents (it was after a couple of ground squirrels at one point, poised to pounce, but every time one of them looked like it might move a bit from its perch, someone would move closer or something and the squirrel would retreat back toward its burrow), it picked up a few of them and looked very much like it would like to cross the road with its booty -- but the crowd wouldn't part enough to give it a lane. Eventually, it re-cached the kills and returned to hunting. By then, like you, I left -- I found myself "joining the crowd" and getting way too close -- because "everyone else" was doing it and blocking views of anyone who didn't crowd to the front. I hated myself as I found myself getting closer and closer to that fox. It was really exciting to see one, and to see it hunt, but c'mon folks (me included) give it some breathing room and let it get about its business. I really enjoyed your photos and your report -- and am very glad you left when things got too crowded. It's nice to find others who want the animals to have some room, too! Thank you! 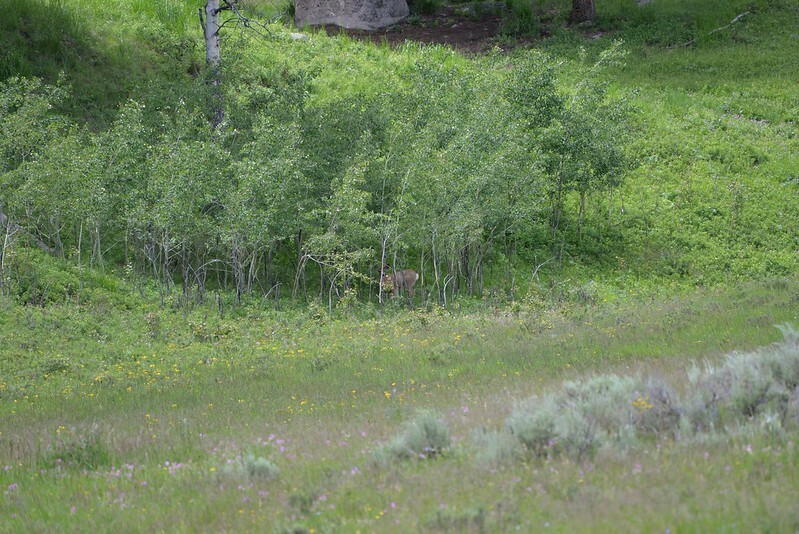 Mule Deer Doe watching Fox hunt her fawns. I think she may have been spooked by proximity to Road and People. 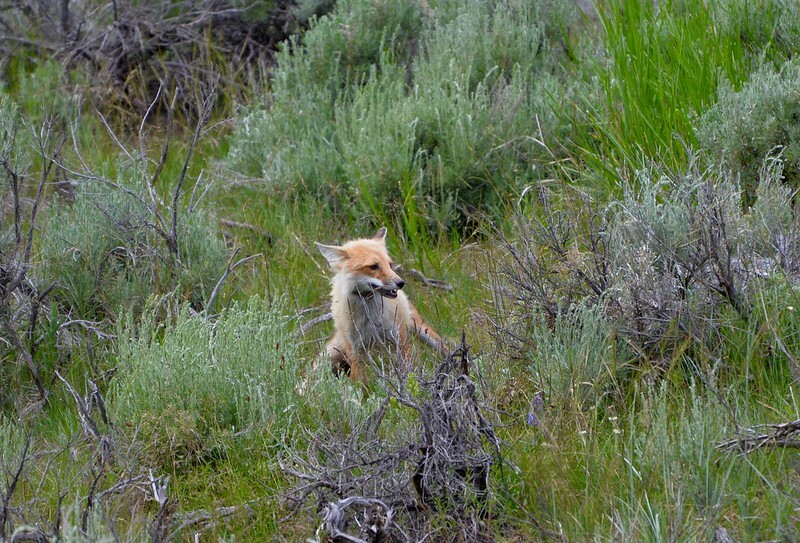 Fox Jumping Back from a sage bush. Gave the initial impression it may have had a snake cornered. Wanted to show a little more of the episode. BTW, One of the Rangers said the Picnic Area Fox had been fed by people and was no longer showing any fear of humans.